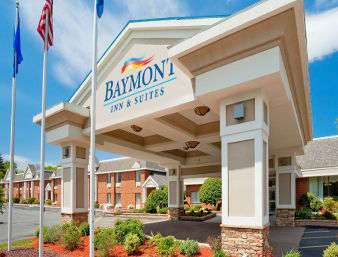 Enjoy hometown hospitality at this Baymont Inn and Suites East Windsor Bradley Airport, just off Interstate 91, minutes from Bradley International Airport and convenient to Hartford, Southern Auto Auction, Six Flags New England and the Mark Twain House and Museum. Pets are welcome at this lodging, which offers complimentary wireless Internet and complimentary breakfast as well as large-vehicle parking, complimentary daily paper. Host your next event in the banquet facility, and take care of work details in the business center with meeting rooms, computer access, and printing, copy and fax service. When the work is done, relax in the indoor pool. Select rooms feature refrigerators and work desks, ideal for longer stays, and there is no charge for kids 12 and under when accompanied by adults.